Yeah, look, again, the CEOs may have made a public show out of leaving Trump’s two advisory councils, but they’re not going anywhere. I will guarantee you they’re not going anywhere. These CEOs are not gonna give up the access they had. They’re gonna continue to leverage it. They’re gonna continue to talk with people inside the administration. They just wanted the video. They wanted the PR value of the video showing them walking away or their statements condemning Trump. Because whatever the media wants, the media is going to get. And if the media wants people condemning Trump, then Republicans and Democrats around the country will line up and give ’em that. “The last two Republican presidents, George H.W. Bush and George W. Bush, implicitly condemned Trump’s reaction to the violence, urging the nation to ‘reject hatred in all forms. '” I thought Trump did that. See, this is where I get confused. I thought Trump did that in all three press conferences. He did. He rejected hatred in all forms. His mistake was to claim that there’s hatred in Black Lives Matter and that there’s hatred in Antifa. There’s hatred in Occupy Wall Street. That’s what Trump did wrong. You can’t do that. There’s no hate on the left. The hate is all on the right. But Trump did. And, in fact, isn’t that why he’s being savaged? If Trump would have just stopped, if Trump would have just condemned the hate among the Nazis and the white supremacists… I’m sorry, he did, damn it be, he did, and you know the media said? We don’t think you mean it because you didn’t say it originally. You’re only saying it because we’ve shamed you into saying it, but we don’t think you believe it. So Trump’s probably saying to his staff, “I told you. I told you people that they’re not gonna give me credit for it. I shouldn’t have gone out there and done it because I told you it wasn’t gonna work.” So he does the third presser in which he goes out there and launches. Wow, you talk about a speculative story. “Trump’s Crisis Spurs Talk of White House Departures”? Who’s talking about it? The media is talking about it. “A parade of business executives broke ties with Trump on Wednesday.” No, they didn’t, folks. They just made a public show of it. But As I say, they’re still gonna be — in fact, we’ve got audio on this. Let me find it real quick. I’m not the only one saying this. Let me find this. SORKIN: That’s absolutely the distinction here and I think that’s the distinction that many of these CEOs are making in their own minds, which is to say that to some degree the councils had become a bit of theater. While I think they genuinely wanted to discuss and move forward with policy, they’re still gonna be able to do that and I think they still will without the association, if you will, of these councils themselves. It’s just not gonna be done with the cameras. RUSH: See? Exactly as I told you. This is CNBC, Andrew Ross Sorkin. These guys are not gonna give up this connect. They’re not gonna give up this leverage. They just want the show. They just want to be able to be seen on TV as hating Trump and refusing to be seen with Trump. Because the media is going to credit them as courageous and brave. They will be loved by their customers and their boards of directors and Twitter will favor them and blah, blah, blah, blah, blah. ISAACSON: The conservative movement in America and the Republican Party in America ever since the days of Reagan and even before have had an umbrella big tent in which Big Business is at the table and very influential, corporate America, but also social conservatives and people of different stripes. That coalition is being broken apart. He doesn’t really have any members of that coalition anymore. He’s getting down to Steve Bannon and David Duke as his last two coalition members. EISEN: You know that’s not true, Walter. You know there’s work being done at the Treasury and in Gary Cohn’s team and people like Reed Cordish’s team that are working actively with the CEOs. I’m just not sure how much of that changes, and I’m not sure how much the market is thinking anything changes as well as far as the legislative agenda. ISAACSON: No. And you’re right. RUSH: What do you mean, Walter? No, I mean, you’re right after you just got through saying that everybody had abandoned him except for Bannon and who, David Duke? What a stereotypical creation that Isaacson went through there. Well, they were big tent corporate titans, bigwigs, and even the social conservatives. But with Trump they’re all leaving. And it was Sara Eisen, “Come on, Walter, you know that’s not true. 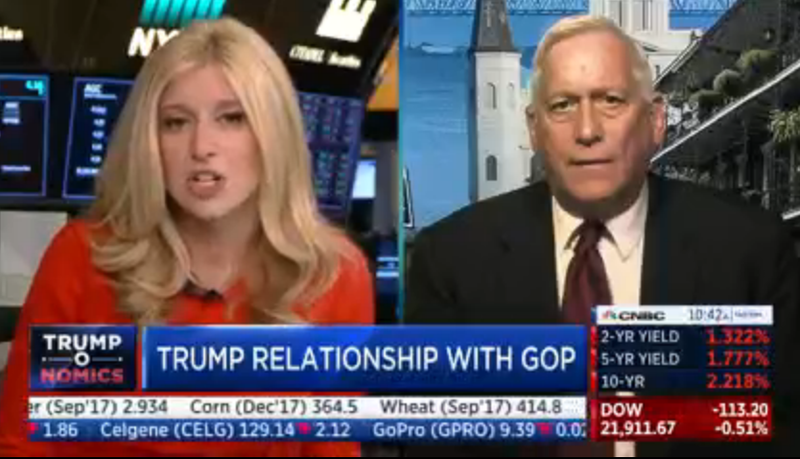 Gary Cohn’s still in there, and these guys are still gonna be talking to him.” And Isaacson, “No, no, no, I mean, you’re right, you’re right.” So Isaacson was gonna get away with that if Sara Eisen hadn’t stepped back into it and forced him to take it back. So there was a good example.